Where did the Facebook Updates go? In the past, becoming a fan of the Twin Cities Naturalist was as simple as clicking on the "Follow this Blog" button over on the left hand side and, voilà, the feed would appear in your facebook feed. Sadly, those simple days are gone as Facebook re-designed how content is displayed. Many people have not caught on to how the new "news" feed works in Facebook. It only shows select content, not everything like the old feed, so the most recent posts from blogs you follow or even status updates from friends may or may not show up. You can click on Status Updates on the left hand menu in Facebook but then you only see status updates and not posts from blogs you follow or from fan pages you follow on Facebook. 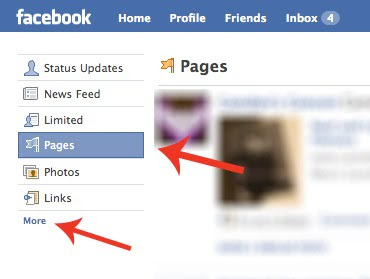 To make sure you see the most recent posts from blogs you follow though the Networked Blogs application you need to click on Pages in the left hand menu in Facebook. This will show all of the feeds from the pages and blogs you follow. Facebook has essentially split content onto different "channels" and you now need to select which channel you want to watch. Many people are confused because the "news" feed which looks like the old feed where you saw everything is actually a much abridged feed and Facebook somehow decides what you should and should not see. So, to follow the blog be sure to click on the Pages link to view that content. If Pages isn't one of the options listed you can also click on "More" and it will appear. Once you have clicked on More you can then re-arrange the order of the navigation options by dragging them around. I was surprised how much content I used to see in my regular feed is now in this alternate Pages feed. While you are viewing the pages feed, be sure to leave comments on stories or click the "like" button. The more you do that the more likely the Twin Cities Naturalist feed is to appear in your general news feed.